NOTICE: Activation key must be used on a valid Steam account, requires internet connection. ABOUT THE GAME	The legends speak of a long forgotten prophecy...of a shining hero and of perilous adventures...of sinister powers, strange worlds and swarms of fairies...but they said nothing of a girl with a big heart instead of a big sword! 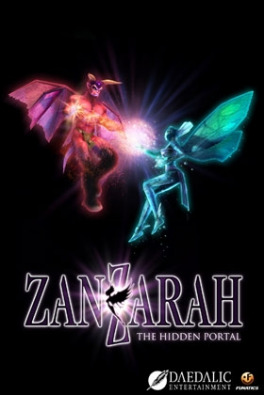 After years of waiting, this legendary classic and beloved fa… n favorite finally comes to Steam!Zanzarah - The Hidden Portal is an amazingly enjoyable adventure game brought to life by a vividly visualized and elaborately produced world. The story revolves around a young girl named Amy who escapes to the magical world of Zanzarah. There she is charged with merging the fairytale kingdom with the real world, saving it from destruction. Help her to use magical powers and items to collect and train fairies and demons. Use your creatures in fast-paced battles to defeat the evil that defiles Zanzarah.KEY FEATURES Rich and fantastical game world. Collect, train and organize fairies and demons for magic duels. 77 different fairies and demons, 12 different elements. Action-based combat system. Includes the fantastical original soundtrack.SYSTEM REQUIREMENTS Minimum Requirements: Athlon or Pentium® 2 Processor with 500 Mhz 64 MB RAM 3D-Graphics card, 8MB (GeForce, Voodoo 5500) Windows®-compatible mouse Operating system: DirectX® 8.1 compatible OS (Windows® 98,Windows® 2000,Windows® XP,Windows® VISTA,Windows® 7, Windows® 8)KNOWN ISSUES: If you have a 3D-card with the Kyro chipset, we recommend to switch into the 16 bit-mode because otherwise graphics errors may occur.Matrox G400/G450 Please use the latest WHQL driver (4.12.01.2010 or greater), otherwise graphic errors may occur. NVIDIA cards have old drivers, but this can be fixed with an update. Symptom of NVIDIA cards: broken polygon display after starting the first scene. Solution: 1. Open NVIDIA control panel 2. Go to Mange 3D settings -> Program Settings, there, select Zantph.exe 3. Set the Maximum count of pre-rendered single frames to 1 and... 4. Apply.The grapic-errors should now be fixed. Incompatibility with notebooks (FPS drops in the menu): Set your screen resolution to a modus with 32 bit color depth. © 2015 Daedalic Entertainment GmbH and Funatics Software GmbH.Daedalic and the Daedalic-logo are registered trademarks of Daedalic Entertainment GmbH. All rights reserved.